The ‘Bon Ami Point Range Front’ lighthouse was constructed on Inch Arran Point in 1870. It was built to guide steamers and other vessels to safety at night. 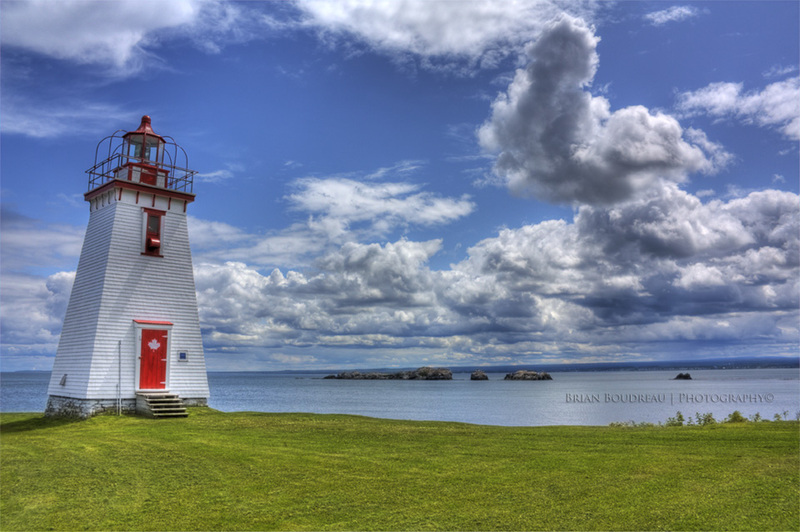 Prior to the construction of the lighthouse, a woman by the name of Marie-Louise (Landry) Arsenault, the “medicine-woman” whose house was very close to Inch Arran, placed a bright light in one of her windows to guide her sons, who were captains of the boats coming into Dalhousie. Mrs. Arsenault did this for many years before it was decided that an actual lighthouse would be built nearby. Under the Federal Heritage Buildings Policy, the Bon Ami lighthouse became recognized as a Federal Heritage Building on September 5, 1991. To this day the lighthouse remains in operation and in clear weather, can be seen at a distance of 16 miles. It is a perfect spot for panormanic photographs, birdwatching, and it is a stone’s throw from the Inch Arran Park campground where you will find a gift shop featuring local crafts and artwork as well as a Visitor Information Centre. Bonjour…I was doing some research on my great-grandmother (THE Medecine Woman) when I came across your beautiful pics on Inch Arran. Wonderful work – I came across one that was taken right from the shore (at low tide)…wow – you are talented !! !